Detail of gilding and stencil work! 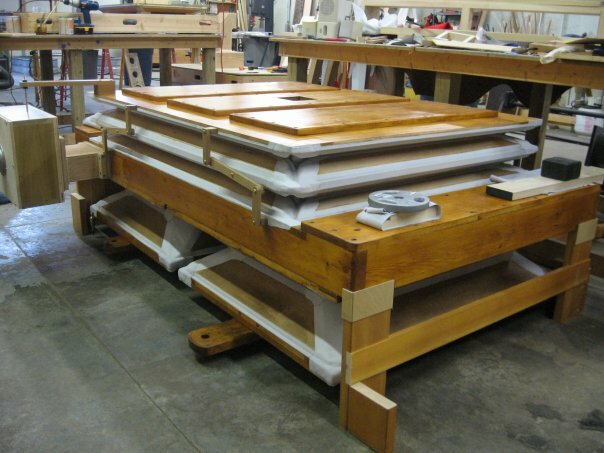 It has been a great privilege for Buzard Pipe Organ Builders to undertake a complete phased restoration of the 1905 Barckhoff organ installed in St Joseph’s Roman Catholic Church, Chenoa, Illinois. Our firm cared for this organ in its deteriorating condition for many years. Within the last four years restoration work has been undertaken in five stages, as funds allowed. 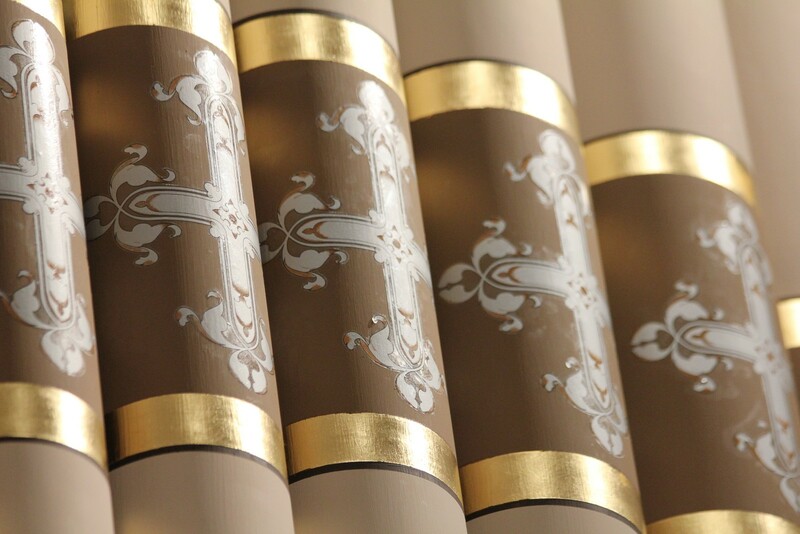 This article describes the project, with special attention given to the final phase of the project, the re-decoration of the organ’s façade pipes to their original pattern. pitch A-435 at 68 degrees F.
In 2008 we restored the original double-rise reservoir with its attendant feeders. This unusual double-rise reservoir was not constructed in the typical 19th century American manner with a set of inverted ribs for the top section, but rather two sets of regular ribs, such as found in Hook organs. Another unusual feature is the “square drop” feeders, instead of the usual wedge feeders. 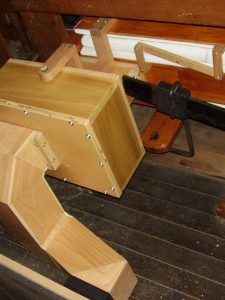 Because of this arrangement, a stout iron rocking frame is located on each side of the reservoir and connected to the short end of each feeder, making a very efficient, though rather stiff action. 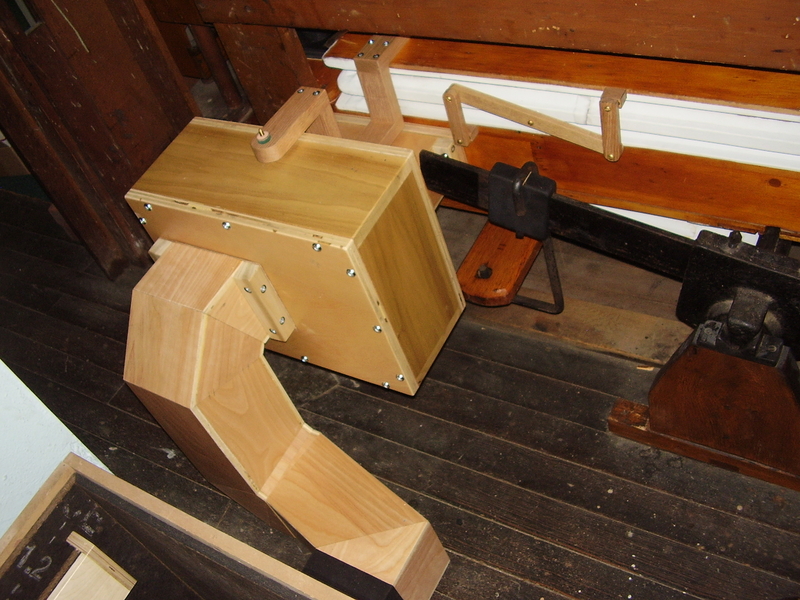 The original pump handle projecting from the organ’s casework had long since vanished, but we were fortunate that another Barckhoff organ in our care retains its pump handle, which we were able to borrow in order to make a duplicate. We provided a new electric blower to replace an ancient noisy machine, as well as an automatic one-way valve to facilitate hand pumping without losing wind to the blower. 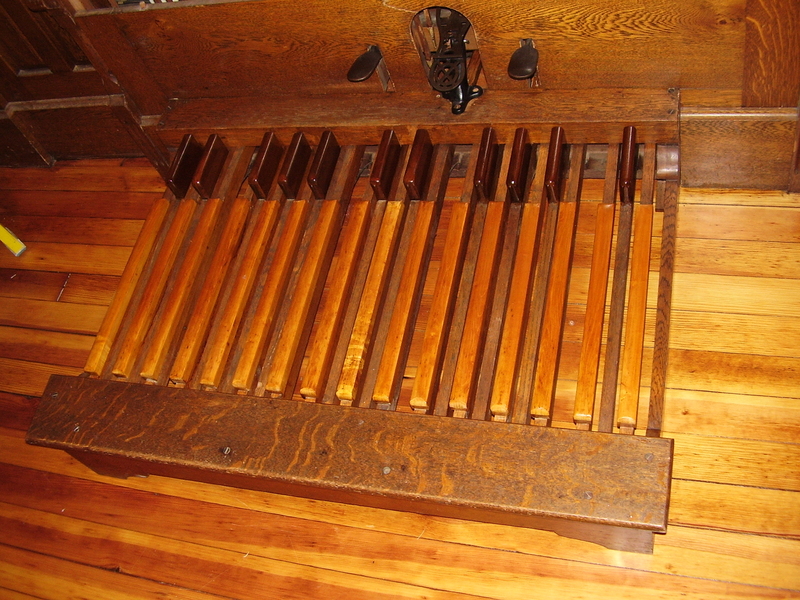 During the second phase of work we restored the pedalboard, Pedal 16’ Subbass pipes and their tubular-pneumatic actions. The stoppers of these pipes required complete re-leathering and re-fitting; splits in the pipes themselves were repaired. 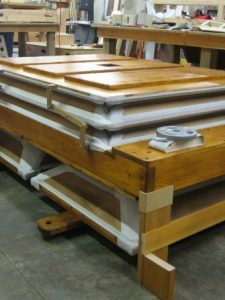 The pneumatic touch-boxes and windchest actions were completely restored with certified pneumatic leather from Columbia Organ Leathers. The third phase included restoration of the keyboards and the manual key actions, including complete re-bushing of the original keys, cleaning, re-buttoning, bushing and adjusting the action, as well as restoring and adjusting the manual and pedal couplers. This last detail also required some new “on” and “off” coupler thumb pistons to be made and engraved to replace missing originals, carefully replicated for us by Harris Precision Products. The fourth phase featured complete restoration of the pipework, including straightening and repairing pipes that were damaged during former years of unprofessional tuning. Stopped wooden pipes were re-leathered and the whole was tonally regulated, carefully retaining the original voicing and scroll-and-cone tuning system. Tonal Director, Brian K. Davis, and his assistant, Steve Downes, demonstrated their advanced pipe-making skills in successfully making these repairs to pipes made of very brittle zinc and badly battered delicate pipe metal, keeping the organ at its original pitch and temperament. Cleaning the spotted metal pipes provided a special challenge, as many of the pipes had accumulated the residue of animal urine, as well as having considerable surface erosion from what must have been someone’s particularly acidic sweat. Our usual practice of washing the pipes in a mild detergent was insufficient. In past projects we had occasionally used what was available from Peterson Electro-Musical Products as “Chem-Clean” (which UPS no longer allows to be shipped in one-gallon plastic bottles). This product, Ethylenediaminetetreacetic Acid Tetrasodium Salt (C10H12N2Na4O8.2H2O), is available under the trade name Hampene (Versene, Kalex, Dissolvine), and is available in a shippable, commercial five-gallon pail. We secured this from Kraft Chemical Supply in Melrose Park, IL, and used a dilute solution which, with careful rubbing, removed all of the accumulated material on the pipe surface. Please be aware that it is absolutely necessary to rinse the pipes repeatedly in hot water and wipe them, in order to remove all traces of this substance. Otherwise any remaining residue will cause a white powder to eventually appear on the surface of the pipes. The fifth and final phase, hinted at above, was the re-creation of the original decoration of the façade pipes. Even under the dirty and poorly applied former gold paint, it was always obvious that these pipes had originally been decorated with what appeared to be very beautiful and extraordinarily detailed stencils. This was obvious for two reasons; first, one could observe a well-defined “ghosting” of the original stencils through the layers of paint; second, we were able to examine a very similar Barckhoff, also in rural Central Illinois, built within a year or two of the Chenoa organ and with its original façade decorations intact. The first step of this project was to carefully strip back the layers of paint applied over the original decorations in order to research colors, banding and stenciling positions. 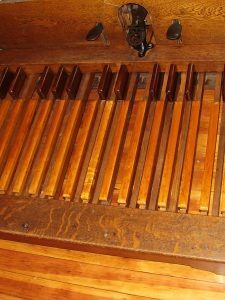 It appeared that the stencils of the Chenoa organ matched sample pipes borrowed from its sister instrument, which could provide samples from which to re-make stencils to apply to the Chenoa pipes. 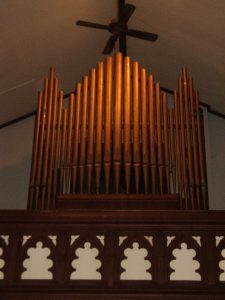 For this initial and important research, we were most fortunate to engage the professional consultation services of Marylou Davis, who is well-regarded as an authority in the field of organ pipe decorations. Ms. Davis travelled to Illinois to see the organ, the church itself and our factory, to help us to identify the intimate details of the project. During her visit it was discovered, by very close inspection of the sample pipes, that what we had assumed were stenciled decorations were in fact decals. This fascinating discovery prompted a very different approach to the work of applying the decorations, though the work of applying base colors and bands remained the same. Ms. Davis’ expert opinion, in consultation with the Parish’s Priest, The Rev. 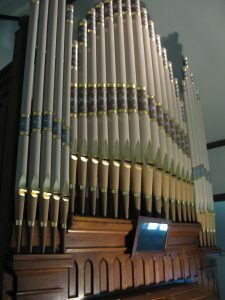 Carl Lopresti, in conjunction with examination of the remaining original materials on the pipes, determined the colors to be used. The pipes were carefully stripped of their additional layers of paint, so that what remained was as much of the original decoration as could be carefully retained for future documentation. From this layer, detailed measurements were taken and then the pipes were entirely sealed with a primer which not only prepared the pipes for their final paint scheme, but also safely preserved the remains of the original decorations for any future historic analysis. With the pipes thus primed, the feet, mouths and bodies were hand painted with their various hues. The casework consists of a large central flat of pipes flanked by two smaller flats with a slight variation in the colors between the two. The shading theme remains consistent in both, and moves from darker in the foot to lighter in the top of each pipe. 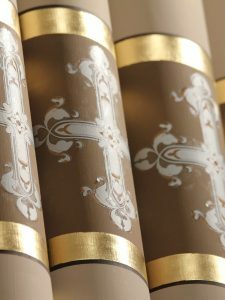 With the paint applied, careful measurements and layout markings were made for the positions of the bands of color that would eventually become the backgrounds for each decal, as well as the positions of the gold-leafed bands which frame these areas. As we did not yet have decals to apply, the penultimate stage of work was to apply the genuine gold-leaf to these bands, as well as the mouths of the pipes. In this aspect of the work, I was pleased to have John-Paul Buzard as my teacher. John-Paul has tastefully gilded highlighted areas of the firm’s new organ cases, and he was happy to share his significant skills in this area with me. And so together we carefully applied gold leaf to these historic pipes; bright 23kt plain gold to the center flat of pipes, and a contrasting “red gold” to the corresponding positions of the side flats. The result of this decoration, even without the silver decals, was truly stunning. 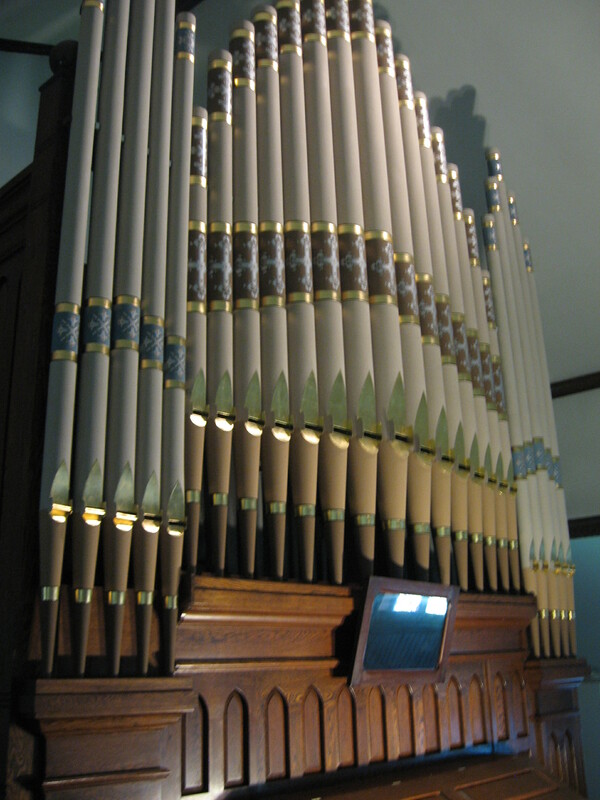 The pipes were carefully transported back to Chenoa and installed in the organ façade, much to the delight of Father Lopresti and the Parish at large. During this work, we began to research the options for re-creating the four exquisite decals found on the sample pipes from the sister organ, which matched perfectly with what could be examined from the Chenoa pipes. We approached the Art Decal Corporation, of Long Beach, CA, who agreed to examine photographs of these decals and discuss the feasibility of their re-creation. They were able to determine exactly the type of process of manufacture and application of the original decals, but informed us that such decals had not been made in this manner for more than 50 years. Happily, though, they agreed to take on the project and set their talented artist Ms. Rebeca Hernandez to the task of turning our detailed photographs and measurements into computer generated images of the decals. This was no mean feat, as the photographs were taken of decals on the round surface of an organ pipe! However, Ms. Hernandez succeeded admirably and produced beautiful artwork of our completed decals. Once this step was finished, a sample decal at 50% size was sent to us for testing and approval. We made various plywood panels, which replicated both the background color and the gold-leaf banding, and then applied sample decals. We then took an old zinc pipe from our stock (which proved once cut to length to be a 50% replica of the largest pipe in the Chenoa façade), painted and gilded it, and applied a 50% size decal sample to it. We were very impressed with the result and gave our approval to Art Decal Corp. to produce a full-size run of all four decal patterns. 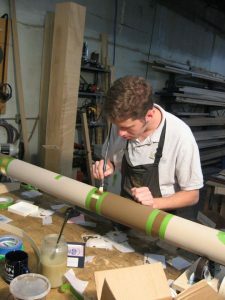 Once the decals arrived, we promptly set about applying them to the pipes. Rather than risk damaging the painted pipes in transport back to our factory, we decided to carefully remove one pipe at a time and apply the decals in the gallery beside the organ. This process proved to be rather tricky at first, and I was happy to have a set of spare decals, as the first few were sacrificed as I developed my technique! However, with persistence all of the decals were applied within 3 days. The decals proved to be the crowning jewel of this work. Their striking metallic silver, fine black definition lines, delicate dotted brown shading and florid Victorian details are immediately eye-catching at a distance, and gorgeous at closer inspection. Now, this fine instrument speaks and looks as well as it did 105 years ago. The Parish as well as Father Lopresti are overjoyed with the result, and proudly and happily share their restored pipe organ with the community and enjoy it in its primary function; giving Glory to God. Double-rise reservoir with square feeders – 3” wind pressure, pitch A-435 at 68 degrees F.